Mon Amour is French for My Love and this pretty Puppy Angel Dress knows it! Made from 100% cotton the layered skirt design combines dotted black fabric with solid colour for a really chic look! The dress has cute black polkadots on the ruched capped sleeves while the neck is trimmed in the same fabric. There is a pretty Paris-inspired transfer on the back that's lots of fun too! 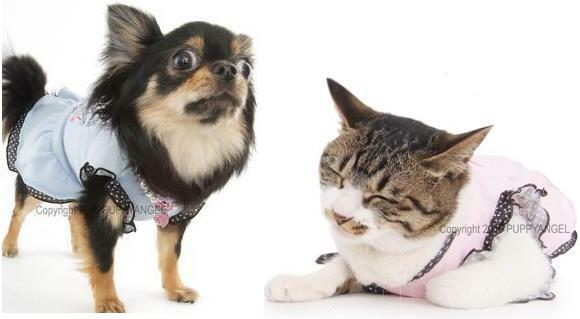 Imagine your darling pet in this luxury dress! Available in sizes XS S M L XL and colors Pink and Blue.